How Much Protein Do Dancers Actually Need? You've probably heard that protein is essential in a dancer's diet. But you might not know what protein actually does for your hardworking bod, how much you should be eating, and—gasp!—why it could actually be overrated. We asked Andrea Chernus (a registered dietitian nutritionist who advises Juilliard students and Hamilton cast members) and Nora Minno (a certified personal trainer, registered dietitian, and former pro dancer) to spill all the protein pointers they share with their dancer clients. Why Do Dancers Need Protein? "Protein is important for everyone, especially young dancers," Chernus says. Your body uses protein for growth and development, muscle repair, immune function, bone development, and energy metabolism, to name just a few. "When you lose blood from menstruating, protein helps make new blood cells," Chernus adds. How Much Protein Should Dancers Get? "One rule of thumb is to make protein about 20 percent of your daily calories," says Chernus. "Depending on how much you're dancing, it can be anywhere from 10 percent to 35 percent of your caloric intake. You might also need more protein when you start a new training regimen. Once muscles acclimate, they won't need additional protein to repair themselves." That said, don't fixate on percentages or total grams, which depend on body weight, gender, whether you're growing, and how grueling your dance schedule is. If you're still concerned or unsure about your protein needs, consult a nutritionist who works with young dancers. Yes, says Minno: "Too much protein can be hard on the kidneys." And if you ignore natural hunger and satiety cues to single-mindedly focus on an arbitrary number of grams of protein, you might end up feeling too stuffed to dance well in your next class. "It's better to eat a varied diet that includes the three main macronutrients in balance: proteins, carbohydrates, and fats," Minno says. What Happens with Too Little Protein? "Getting hungry only a couple hours after a meal can be a sign that you didn't have enough protein at that meal," says Chernus. "Insufficient protein intake can also cause fatigue and muscle soreness. After a while, hair can fall out or thin." But don't worry—this won't happen after just a week or two of not enough protein! "The body can't store protein for later use the way it stores fat or carbohydrates," says Minno. "Before and after dancing are the two most important windows to help your muscles rebuild quickly and efficiently. If you're weight-training or dancing a ton, consume at least 10 grams of protein pre- and post-exercise." TL;DR version: Spacing your protein intake out throughout the day is best for dancers. What If You're Vegetarian or Vegan? "Being vegetarian or vegan is about much more than just being a meat avoider," says Chernus. "It's important to include good sources of protein to replace what you're omitting." Meeting with a dietitian or sports nutritionist might help you understand what your body needs on an individual basis. 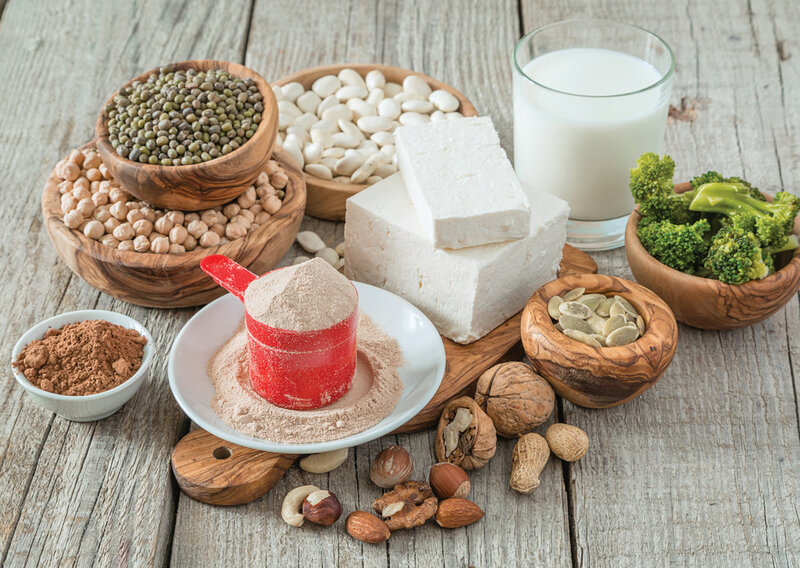 Those on plant-based diets will need to eat tofu, soybeans, edamame, tempeh, dairy (if you're vegetarian), and other varied sources of protein. "Dancers come to me and say they're vegetarian, but that they don't eat beans or soy," says Chernus. "They're not going to be able to fuel their bodies appropriately, and there'll be too much muscle breakdown—which is a recipe for injury." Protein bars, shakes, and drinks shouldn't be your only sources of protein. "If you're at the theater all day and don't have time to go heat up a quinoa bowl, a protein shake or protein bar can keep you full, satiated, and energized throughout the long day of dancing," Minno says. Whey, pea, rice, egg, and soy protein powders are all backed by research—choose whichever tastes best to you. "But don't spend money on extra supplements unless you're having trouble fitting in your daily protein needs," Minno says. "Dancers typically think they need more protein than they do," Minno says. "The general recommendation for an average teenager is about 52 grams of protein, and young dancers who aren't trying to bulk up don't need to exceed that." Real talk: Most Americans get enough protein as long as they're consuming enough calories and eating a balanced diet. Focus on real foods, different colors of fruits and vegetables, and different plant foods and proteins, and you'll likely get what you need. As Minno says, "If you look at your diet as a broad, 24-hour experience, you won't have to focus too much on any one part of it." A version of this story appeared in the October 2018 issue of Dance Spirit with the title "Perspectives on Protein."